I’ve noticed that my creative process is very intuitive and usually impulsed by strong emotions, from dissapointment to utter joy… I’m learning to embrace it and that is how all of a sudden I’ve found myself drawing more than ever. Of course, this is not only about drawing to me, it’s far more significant and spiritual. 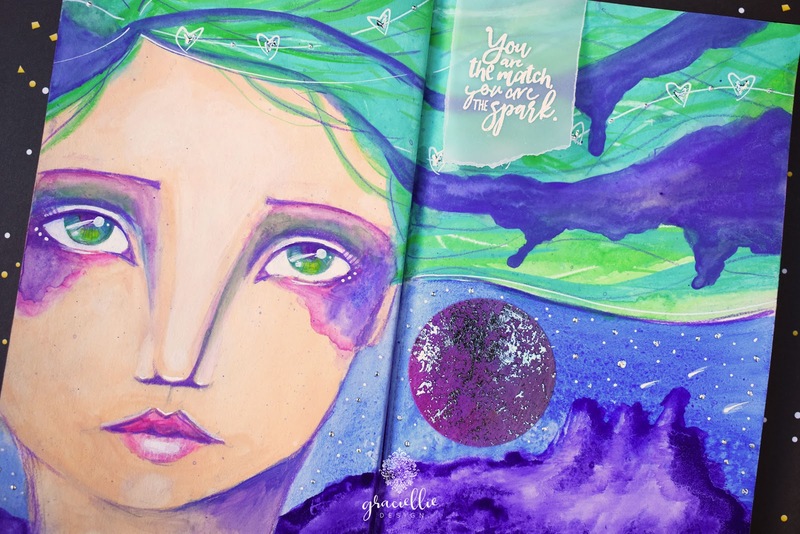 Today’s art journal spread came from a place of happiness and content. I sketched my girl, left it there and came back to work on it again yesterday. Again, my heart was in a happy place when I started painting and although I didn’t know the details and the story that would emerge, the final meaning of these pages turned out to be very significant to me. For the first time ever, I painted my pages with gouache. My husband got me lots of coloring media on his last work trip to China, including a large Marie’s Extra Fine Gouache set of 36. I enjoyed working with them. It makes so much sense that artists often use gouache for children’s book illustrations. It’s paint and watercolor at the same time. Its properties are a little different from watercolors… It doesn’t blend the same and it’s more opaque I’d say. I felt comfortable using gouache, so I guess this is where trying out new media makes the process much more fun and creative. I did use some watercolors to add drama around my girl’s eyes. I used Jane Davenport’s Aquapastels (my go to watercolors now a days). For definition and detail I used one Prismacolor pencil (Parma Violet) and an Acrylic Paint Marker from Sharpie (extra fine point). Something that you can’t see on the pictures is the shimmer on the hair and eyes that I added with a Spectrum Noir Sparkle marker. Of course, to be able to use all these media I added 2 light coats of The Crafter’s Workshop Clear Gesso Matte Translucent, just to be safe and also to avoid any paint to transfer to the back of the pages on which I plan to work. Although it may be hard to believe once you see a finished page, in many cases the meaning behind it comes through a simple paint splatter that gives birth to a strong idea that you were trying to catalize intuitively. In my case the mountains on the bottom of the page defined what these pages were going to be about. Of course they weren’t mountains at first, but actually gouache dripping upside down and just like that, I knew what I had to do next. To finish off my page I added Deco Foil in Silver wherever possible… Foiled details -I knew- would go very well and so I used Deco Foil Liquid Adhesive to make little stars. The moon was actually a correction I had to make because -yes- I made a mistake trying to stamp directly on the page and for some reason, it did not work. But hey, it was meant to be (and I love it). I cut the moon from a foiled piece of Therm O Web Mixed Media Sheet that was hanging around somewhere in my studio and it worked great. On Saturday I finally got a book I bought even before it’s release, Create Your Life Book by Tamara Laporte from Willowing Arts. I was curious about it and then when I got it all I could do was caress it… It’s so pretty. (I love art books.) But more important than that, one thing I’ve always admired from Tamara is her ability to add lots of little details to a page. I’m usually cautious when I’m finishing a page, because adding too much detail could end up ruining it… But, with Tamara’s book right beside me as a source of inspiration I decided to go for it and I think I did ok considering this is my first time adding doodles to a piece. From a starry sky to heart doodles on my girl’s hair, details really made a difference! Thanks so much for stopping by today. 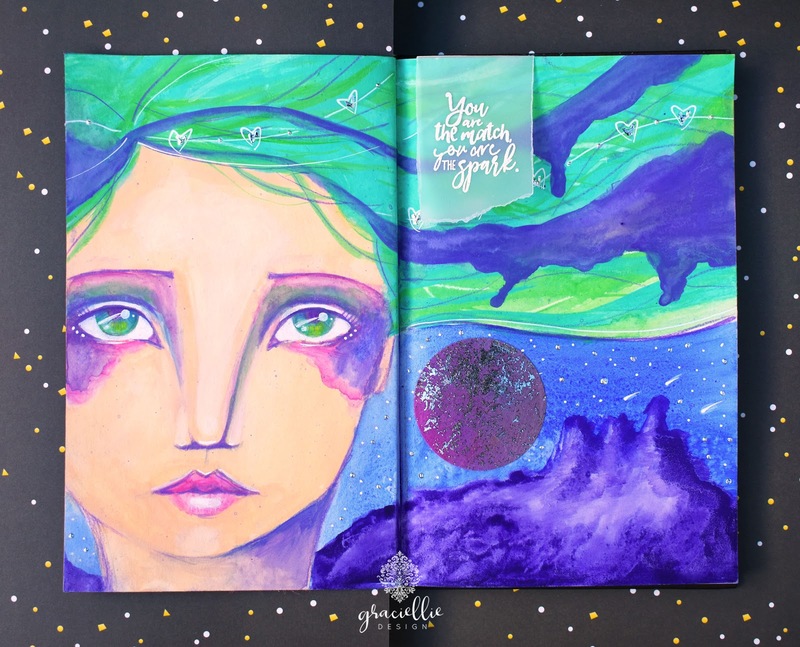 I thought I’d take a moment to share some details about this page spread so you know the creative process I am personally going through and of course to inspire you to pursue your creative path, whichever that is! That’s all for now. Until next time. Beautiful and I really enjoyed reading about your process. Es un dibujo precioso, con una expresión increible, muy auténtica.